Local Hero at the Edinburgh Lyceum. Design, Scott Pask; lighting design, Paule Constable. Photo: Stephen Cummiskey. Sometimes it happens that the curtain drops on a performance, the audience stands, thunderous applause filling the auditorium as I sit there, bewildered, wondering whether I’ve just seen the same thing as everyone else. Luckily, it doesn’t happen that often. But when it does, especially if I’m reviewing, I return home to sleep it off. In the morning, I’ll read the first batch of reviews. It’s the only time I ever read published reviews in advance of writing my own. It helps me work out whether or not I did actually see the same show as everyone else. Now that I’ve got plenty of experience behind me, I know that such feelings typically go hand in hand with a show that leans heavily on British cultural references that simply aren’t in my makeup. That tends to happen when you’re born and raised in the USA. Not only does it mean I’ve not got certain cultural foundations, but it also means I haven’t got rose-tinted specs when it comes to beloved classics. Hence, my bewilderment at curtain call when the audience whooped and clapped and hollered following the press performance of David Greig’s adaptation of Bill Forsyth’s 1983 film Local Hero at the Royal Lyceum in Edinburgh. Apparently, Bill Forsyth’s 1983 film Local Hero isn’t just Bill Forsyth’s 1983 film Local Hero, but Bill Forsyth’s 1983 much-loved, iconic film Local Hero. And beloved counts for a lot, it seems. The next morning, I met a Scottish friend at the car boot sale. Afterwards we had tea and I told him about the musical I’d been to see the evening before. My friend said that Bill Forsyth, despite being something of a national Scottish treasure, is an idiot. By way of example, he told me of Forsyth’s film about warring Glaswegian ice cream vans. Forsyth had heard a charming tale and made a film about it, without realising that the story about warring Glaswegian ice cream vans was actually a story about warring Glaswegian drug dealers. As for Local Hero, the thing I found most baffling about its reception is that its politics are questionable and its internal logic inconsistent and yet many seem to have fallen for a facile reading of the story as a triumph of environmentalism and Scottish community spirit over big bad Yankee capitalism. Or the ability of a beautiful Scottish landscape to seduce even the most emotionally-challenged greed-is-good executive into changing his tune. Having never seen the film version, I can’t say how well they compare, but these certainly aren’t readings that stand up to the plot of the current production. Here, the American executive—Mac—is sent to small-town Scotland to buy the entire village of Ferness on behalf of big oil. With the exception of two residents, the entire village is absolutely bloody delighted at the thought of trading in the drudgery of coastal graft for an oil refinery and a fat pile of cash. Of the two dissenters, one is a romantic, itinerant Glaswegian (I know, right); the other, a local hermit and beach philosopher who turns out to be a landowner of ancient decree. Community spirit leads most of the villagers to the beach ready to bash in the head of your beach hermit who refuses to sell up, before executive Mac has a low-budget Damascene conversion to the natural wonders of Scottish sea and sky and proposes his cosmology-obsessed boss build an observatory rather than a refinery in Ferness. So really, it’s an old landowner and a loaded CEO who provide the plot resolution (courtesy one ham-fisted deus ex machina) rather than any concern of the local community. There’s a bit in Local Hero where Gordon, the village publican/accountant/man of all trades, negotiates the buyout deal with Mac. Just before agreeing on the final price, Gordon throws down his ace clause: a 1% fee payed to a community trust for every barrel of oil processed at the to-be-constructed refinery. Tense silence. Mac finally acquiesces. At this, the audience breaks out whooping and clapping. Clapping at the idea of a bunch of people earning a fortune off the back of fossil fuel exploitation. Perhaps it’s joyless to poke holes in the magic spell cast over many by this reasonably entertaining and well-delivered revisiting of the original Local Hero, but good grief, haven’t we moved on even a little bit from the values of 1983? It would have been nice to see a semblance of that come through this new production. 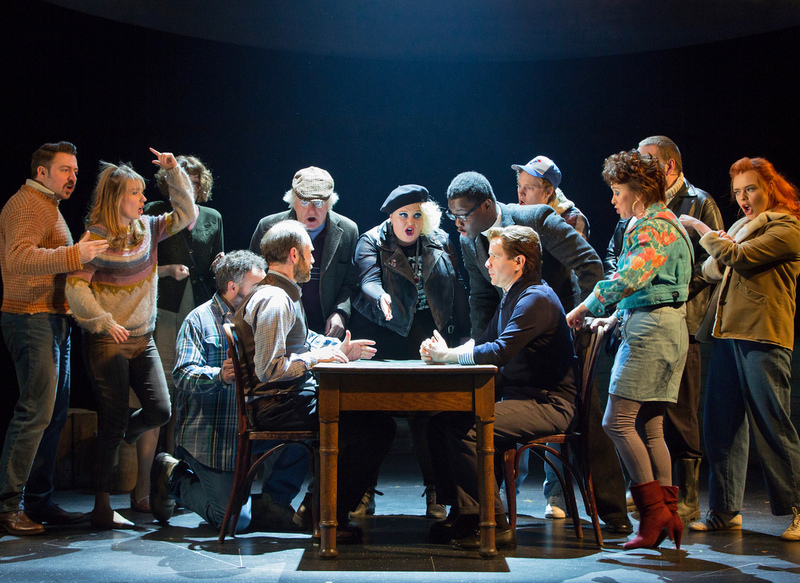 Local Hero runs at Edinburgh Lyceum until 4 May, and transfers to the Old Vic in London in June. More info here.